Bill Clayton's family emigrated to Idaho in 1903, from Spain's Basque country. Bill managed to spend every summer of his youth working on his grandfather's ranch here in Idaho. Bill earned a degree in business, with an emphasis on agricultural economics, from the University of California Berkeley. Following college, Bill served his country as a Marine Corps Captain in Vietnam, where he flew Huey gunships. Following Vietnam, Bill started working in the business of commercial real estate in California. Longing for the rural Idaho he knew as a young man, in 1973, Bill returned to Idaho, first raising Herefords. In 1979, he started a local tree farm, which today ships high quality trees all across the United States. Bill is the father of three fine boys and the proud grandfather of seven more youngsters. Bill has been active on the Board of the Boise River Flood Control District #10, since 1989. Dr Beede is the founder and previous partner of Intermountain Pet Hospital before retirement after 47 years as a practicing veterinarian. Dr. Beede has two Labs, and he enjoys fly fishing, bird hunting, and outdoor photography. He is currently the Immediate Past President of the Boise State Bronco Athletic Association and is a proud BSU supporter. Dr. Beede loves the Boise River, along with everything that the river provides for both area residents and local wildlife. 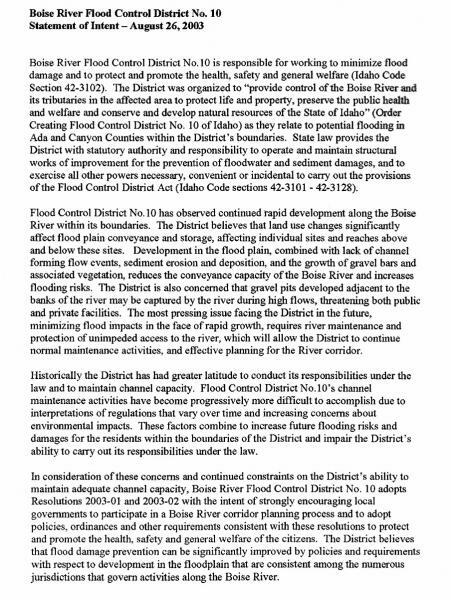 In 2011, Dr. Beede became involved as a Commissioner for the Boise River Flood Control District #10, where he presently serves as the Board's Division 1 representative. The Boise River is the jewel of the Treasure Valley and is vital to each of the individual communities situated alongside the riparian corridor. In addition to being the focus of the Valley, at certain times of the year, the river can also be viewed as a potential threat to valuable property. Dr. Beede demonstrates a commitment to helping the river function as naturally as possible, while still allowing for the annual maintenance that is frequently necessary to help reduce the annual spring flood threat. Mr. Payne was appointed to the FCD#10 Board by the IDWR in 2016. He is President of AJP Farms and actively farms in the Middleton area. Over the years he has also played an active role in the leadership of Water District 63, the Canyon County Ditch Company, and Drainage District No. 2. In addition to his community activities, Jim is an avid outdoorsman, hunting and fishing as time allows.